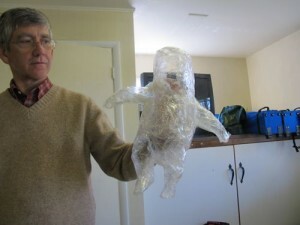 Wrapping plastic wrap and clear packing tape before removing it to make ghostly objects. For the October 18th meeting we made packing tape limbs and ghosts. Well actually we tried everything from baby dolls to swords, and even mixed in a few body parts – basically anything that could be safely wrapped in plastic wrap and then covered in packing tape. Ghost made made by using a baby doll. It will get more transparent after removing more of the excess plastic wrap. 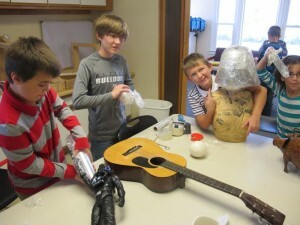 Wrapping an arm or leg and the manikin were definite hits, and looked surprising good! The process is fairly simple: put a couple of layers of clear plastic wrap on the item, then wrap it with several layers of clear packing tape, and finally making a cut in the wrapping to remove the object used. Once the object is removed you take out the excess plastic wrap and carefully re-tape the pack tape wrapper back together for a clear ‘shell’ of whatever you wrapped! Adding some LED lights inside the object can make a great ghost or really strange object for Halloween. For our upcoming meetings we’ll be having a intro to coding class for 9-14 year old kids and a soldering class, next meeting dates are on our events page.